KHK USA Inc offers the largest selection of stock metric gears in North America. With over 175 types, in more than 15,000 configurations, KHK USA offers the broadest selection of spur gears, helical gears, internal ring gears, gear rack, bevel gears, worms & wormwheels and other gear types. The spacecraft engine that will help take humans to Mars may be based on a relatively diminutive University of Michigan prototype. NASA gave this dream new credibility earlier this year by funding a spaceflight propulsion system to be built around a tabletop-size thruster developed in the U-M Department of Aerospace Engineering. This ion propulsion system is up against two competing designs, but it has a head start. 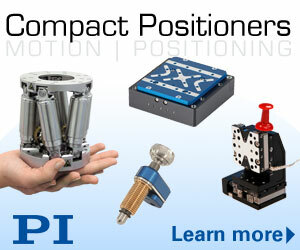 Learn all about compact positioners from the best in the business, Physik Instrumente (PI). Bolt loading can vary greatly during product testing and operational conditions, enabling premature and unexpected structural failures to occur. This makes measuring and verifying bolt preloading essential to compensate for the unloading that naturally occurs over time. Sensor specialist FUTEK runs through why verification of bolt preload and load change is critical and shows how to perform the testing. Protecting vehicle wire harnesses from overloads that could be catastrophic is a critical design criterion. 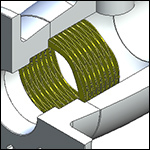 The designer must ensure that the fusing strategy protects the wiring. Mike Stamper, Mentor Graphics, describes a method of determining the exact amount of current a wire can carry without damaging the insulation. These values can then be used to automate fusing strategy, ensuring proper protection of all circuits. Optomec, a supplier of production-grade additive manufacturing systems for 3D-printed metals and 3D-printed electronics, recently announced that its Aerosol Jet technology is being used by LITE-ON Mobile Mechanical for high-volume production of electronic devices. What a cool way for the Albuquerque-based Optomec to show off what its fine-feature 3D-printing technology can do, like printing antennas on uneven surfaces. MICROMO launches the new FAULHABER 20/1R planetary gearhead, offering the most powerful transmission technology in its class. A 20-mm diameter allows the stainless steel gearhead to achieve continuous torque of 800 mNm and up to 1100 mNm in intermittent use. The input speed reaches 12,000 rpm. The 20/1R gearhead can be combined with small brush DC, brushless DC motors, and stepper motors with a diameter of 17 to 22 mm. On the evening of April 20, 2010, Deepwater Horizon suffered a blowout while drilling in the Macondo Prospect, an area in the Gulf of Mexico 40 miles off the southeast coast of Louisiana. The platform caught fire, and two days later, it sank. Eleven crewmen were killed. The spewing oil caused the largest offshore oil spill in U.S. history. In this article, engineers use Abaqus Finite Element Analysis to do some of the detective work concerning what went so terribly wrong with the rig's blowout preventer stack. Boothroyd Dewhurst Inc. will host the 31st annual International Forum on Design for Manufacture and Assembly (DFMA) on June 7-8, 2016, at the Crowne Plaza Hotel, Providence-Warwick, RI, USA. This year’s conference theme is “DFMA Design Decision: Understanding Total Product Cost.” Presenters at the Forum will discuss how making the right design decisions early in development can have a substantial impact on total product cost. The use of DFMA to help choose the right structures, materials, processes, and labor has become critical given that companies get few second chances in today’s global markets. Additionally, the benefits of improved reliability and time-to-market that come with DFMA will be addressed by various speakers. New PEM Type SMPP self-clinching nuts from PennEngineering install permanently in ultra-thin stainless steel sheets and provide dimensionally ideal solutions for stainless assemblies where space for attachment hardware may be limited. A minimal footprint resulting from an overall low-profile design combines low height (.065 in./1.4 mm) and small diameter (.220 in./5.6 mm) with close-to-edge mounting capabilities for installation in stainless steel sheets as thin as .025 in./0.64 mm. Their corrosion resistance will be similar to 300 Series stainless steel. 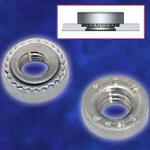 Upon installation, a serrated clinching ring prevents the nut from rotating in service and, ultimately, the fasteners will not loosen, fall out, or otherwise adversely affect the end-product integrity or performance. 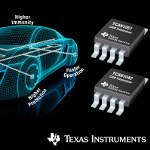 Texas Instruments has introduced two families of controller area network (CAN) transceivers that meet all industry requirements for electromagnetic compatibility (EMC) from U.S. and European automotive manufacturers. Delivering high bus-fault protection, fast CAN flexible data rate (FD) speeds, and the industry’s shortest loop delay, the TCAN1042 and TCAN1051 CAN transceiver families provide the industry’s best combination of protection and high performance for a variety of automotive and industrial applications. The TCAN1042DEVM evaluation module (EVM) is a great place to start.